The Yamaha CS5E is a superb little bicycle. To ride the midget is fun - pure and unadulterated fun. A considerable pleasure in other words. But to write the thing up is anything but. After all, road reports, written all steely eyed and dispassionate, must be critical. In ideal cases constructive, in others merely matter of fact, obvious for all to see, catalogue of faults and deficiencies. Sure - plug the good points, the heart-warming points, but set these against the niggles and nags. And if a machine presents itself at your doorstep which you find hard, if not impossible to fault, what then? Credibility takes an understandable shaking, immediately words are bandied around like "nearer than near perfect". Scepticism, suspicion of motives. Is he getting one free? What's in it for him? Aren't all press machines prepared rather better than those for the ordinary customer? All can be answered with the complacent family standby "we write what we feel, when we feel and as we feel". Good old British justice at its most super-dooper. Sweep all "lying so-and-so" reproaches aside - and accept the truth. Personal interest in Yamahas -the real Yams, not the four stroke which seemed incongruous to the range - hardly bordered on the fanatical. They may have been doing a very fair sweep up job at most race meetings, making bigger four strokes look a little red about the neck. And sure as hell, everyone said they were awfully fast in standard road trim, but an immovable and entrenched dislike of Japanese two strokes, screaming highly tuned through narrow power bands, at the end of their useful life after a couple of years, built entirely for speed and with no great thought for durability, lingered on, a personal bias that no amount of logic or evidence could shift. Then, a half year or so ago, a snazzy little folder arrived on our desks, goading and full of ever such tempting colour pics with a small and neatly scaled down YDS7 as the centre piece. 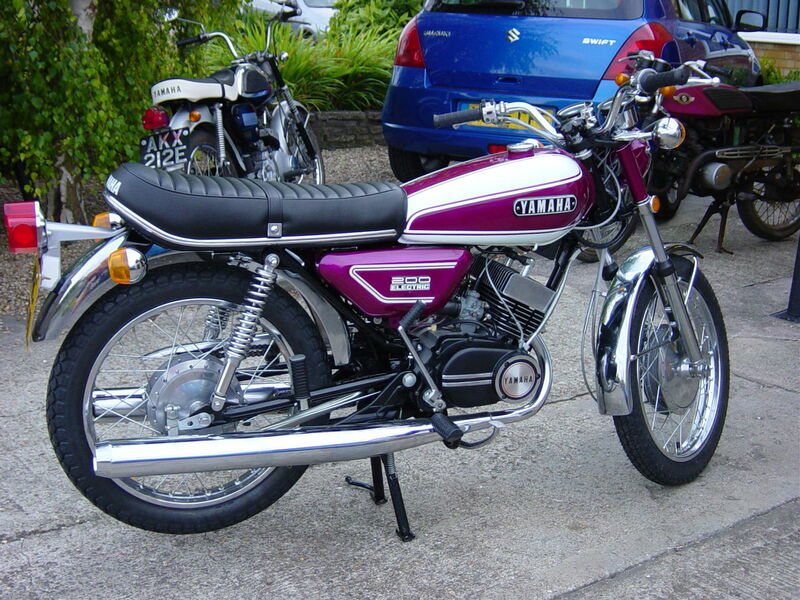 A restyled Yam 200 no less, fetch-ingly daubed over with purple and white. But still a little 'bike, still a two stroke and still the taste buds went unpricked. The editor, asnarl through knitted brows, mumbled something about "ridden properly that front wheel shouldn't touch the ground for long". The remark lay unsought and unwanted, filed under P for Poetic Licence. Forgotten. The thing would be ridden one day, no doubt, but it wasn't a machine that would have me all niggly and restless with hot anticipation for. The seeds of "something good" were sown when the XS-2 had to be tested. Mitsui's demo model was late returning from other tes¬ters and the long walk - well fairly long, and old age approached fast - to the concessionaires, hand in hand with paper thin boot soles, built up a substantial mental block to a pedestrian journey back to the office. "Anything else to pinch for the day?" The new 200 if we wanted it. Unenthusiasm, but any-thing was better than instant health. Perhaps it was a general indoctrination in big 'bikes, or there again a distain of "little engines" that threw into a hazy subconscious a mental equasion that said moving above a snail's pace on small machines requires every ounce of throttle to be used. So, every ounce was used. The dial in front of me had wavered something about four and a half. To be honest, I didn't really care. It was all rather a bore. And at that engine speed I had, if I'd have thought about it at all, envisaged at least three thousand more revs being needed before anything but anything happened. The throttle is a quick action affair - very quick. A quarter of a twist between you and Yehudi Menuhin. And my, oh my, never ever underestimate a Yam 200 again. Nonchalance was rudely and unceremoniously kicked aside by a great bucking leap forward. Suddenly aroused from reverie and concentrating again, the front wheel was watched in surprised, not to men¬tion horror struck fascination, as it dangled about from side to side some eighteen inches off the tarmac. OK - the engine had felt taut and nervous, little Nipponese muscles bunching themselves waiting for their moment. But this was ridiculous. Bordering on the outright silly. Had I known. . . . Below me the motor was giggling back at another sucker taken into the trap, rasping with all the malevolence of an angry hornet disturbed from its nest. Such a pity that the "Stinger" label had been pounced on by the opposition. But by then reflex action had poked the gearbox through into the next ratio. Any hopes that this may have calmed things down a bit were left yards back in a hundred pieces. Nothing had changed. The miniature though monumental fist jabbered the rear wheel round with uninterrupted violence, the eruption beneath me unceasing, going unmitigated by the higher gear. Yes - the front wheel was on the road, skimming the stuff lightly, but things weren't all that much quieter. I've mentioned once or twice that the Japanese tls units I've experienced have seldom met the demands of the machine - ranging from the outright awful to the mediocre passable. Perhaps all Yamahas are an exception to this bias. Whatever it was, the sledgehammer, broomstick-in-the-wheel, stopping force of the little Yam's front brake was unexpected. Totally unexpected and nearly my undoing. A strong handful had been wrenched on the lever. The world stopped and, for an instant, the front tyre left a black tracing of its course in the road. That instant taught me all the lesson I needed teaching. From then on retardation was treated with respect, always thought about. On reflection and, peculiarly, on that first encounter only, the machine was well and truly over braked. It was grabby, and once a certain familiarity had been reached, it needed no effort to stand the motorcycle on its front wheel. Literally, and with no exaggeration whatsoever. Weeks later, with appetites whetted, the machine came to us for a fortnight. The intervening time had obviously seen the brake used hard and the first violent, fearsomely violent, edge had been removed. It still remained a good brake - as far as I was concerned the best Japanese drum yet, but no longer did it frighten. For hard solo riding the unit was entirely adequate - reliable, predictable and firm, still capable of locking at any speed, despite every part of the drum, even that nearest the spindle, becoming far, far too hot to handle. The addition of a pillion made its burden felt, though. Highest lever pressure had the cover squealing like a stuck pig, but at maximum application the lever would inexorably wheeze and finally sink to the grip, though (and' importantly) such fade as there was only occurred under the most exacting conditions. The CS5E is little changed from the previous 200 - the CS3. So little in fact that, when the new model was introduced, and large stocks of frames and crankcases already stamped with CS3 serials were still held by the factory, these components were utilised with no alteration or overstamping whatsoever. All in the name of logical economy, but earth shattering to the proud new owner. The changes have really only been rung in the cosmetics department. The tank, that all important stylistic maker or breaker, is a lower, cleaner object, now matching its shape and paint style more closely to that of the latest 250 and the 350. The family likeness thickens. Only one colour scheme is offered, and although I don't like the connotations behind such a limited choice of finish, I've got to admit that the present purple, white and, thankfully, black frame, is rather fetching. The CS5E joins its brothers with the meaningless but nevertheless attractive fippery of matt black crankcase side covers. Meaningless because the crank cases themselves are still blissfully naked alloy. Still - very pretty, pretty. Visually few other modifications are incorporated. The barrel finning is now black, while the finning of the head is squarer, higher and, from the profile, highly polished. Front forks and rear dampers have lost their shrouding, the former adopt¬ing the "Ceriani look" with inter¬nal springs and the latter wearing today's norm of exposed springs. And those, according to Mitsui, were the sum total of the changes -all of them stylistic and of little importance to performance. But glancing through the spec sheet of the CS3 tested in the '71 issue certain subtle differences were brought to light. Most important were the gear ratios. The newer machine carries ratios substantially lower (higher numerically) and more widely spaced: CS5 ratios to CS3 - 26.15 (25.02); 17.30 (16.56); 13.11 (12.55); 9.651(^.23); top, 7.75 (7.42). New whether this modification was introduced irf a latter batch of the CS3 model is very much open to conjecture. What is reasonably certain is that the top speed of the newer machine is higher. The speedo, due to its positively absurd optimism can, in this case, act as no more than the merest guide-line, but at one time, blessed with a light pillion would you believe, a ludicrous top speed of 96 was recorded. Supposing a speedometer error - perhaps naively - of some 9 and a bit per cent, it still leaves one playing around with an 87/88mph 200cc machine. Which ain't hanging around. At this velocity, rev countings were 8100, a mere 100 over the red line, but well over the optimum power point. (Is there any law on earth which says that rev meters should be any more accurate than speedometers?) Soil's fast. Indecently fast. Carburation, compression and claimed max power remain identical to that of the earlier machines, so apart from quizzical eyebrows at the porting and crankcase filling departments, one is left wondering at the newly gotten urge. One possible, and unexplained, factor contributing to the increase in top speed could be a weight saving of some 22 Ibs in the CS5. Don't ask me how it's done - all the logical weight savers are as before, mudguards, tank, etc. But it is lighter. Or - perhaps, nastily, the imagination of the Japanese spec sheet writer took a more than usually optimistic turn. All but mere variations on an enigma. The only other improvement was in the electrical department. The battery to be precise; a unit now uprated from 5*/2 a.h. to 9. The performance is explosive. Perhaps such guts from such a little engine tends to blind one to the 'bike's other attributes. Certain machines, acclaimed by one and all, with ultimates in acceleration and top speed, have vanished from immediate glowing memory through small, fleeting and so occasional doubts in their road-holding capabilities. And. from an entirely personal view, roadholding is the most influential characteristic - the thing that separates enjoyment from a mere job of work. A chore. Blameless reputations mean nothing to me. and can be banished, albeit unfairly, after the first and perhaps utterly harmless slip or slide. Rings of confidence dissolve into a mist of suspicion, suspicion once thrown up never to be quite forgiven or forgotten. Such seeds of doubt were never, ever sown by the Yamaha -the thing remaining exemplary no matter how abused or thoughtlessly thrown about. So -solo it was perfect, but weight on the pillion and fast, stupidly fast almost, sweeps introduced a certain movement from the rear. A wallow that was more the suspension (set at its hardest) sogging up road irregularities and a.gentle sway in the process than anything else. Never did show the slightest signs of becoming uncontrollable or leading to the sort of thing that one jerks awake at. As I say, a gentle sway from the rear end, nothing more. A little machine being asked to do a great deal, but never enough to deter from abso¬lute enjoyment. And perhaps "enjoyment" is the keynote to the CS5E. The machine was ridden at every opportunity, drudge journeys loosing any vestige of the mundane, other more important duties left undone. It's hard to pinpoint just why the thing was so enjoyed. It obviously had something to do with a machine that so outrage¬ously exceeded every demand made of it, which did everything and anything that it was intended to do, and did it with so much to spare. And, naturally, the small childish joy of sizzling ahead of motorcycles two, perhaps three times its size hardly went uncherished. Throughout our test time with the 'bike it was, perhaps unsurprisingly bearing in mind its small capacity, ridden to the full. There was seldom any happy medium betweeen full on and full off. It is that sort of machine, beckoning incessantly to the rider to ride quickly, using every one of the 22 Japanese horses. And the horses were not easily tired. I had had many evil thoughts that on a long jaunt, tune would be affected, the finest degree lost through what I knew would be one hell of a thrashing. Finally a journey to Derbyshire presented itself. The motorway route was well known and detested, a long sit before a featureless screen. Hard to blame the drivers who fell asleep at their wheels. But the A6 was as much of a mystery as any southern midland road can be, and running almost parallel to the motorway virtually deserted, the hopeless optimist in me figured. Apart from the early morning mist (some call it fog) which left a cloying and impenetrable murk on my visor, the journey was ridden fast. The machine skimmed from one built up area to the next, never overtaken by any vehicle of any description. True - ridden in this manner and with scarce thought to anything but forward motion, it did use rather a lot of petrol. An horrendous amount. The heavy hand taken as read, maximum pace resulted in the unbelievable consumption of 36 miles per gal. Which may happily preclude the machine from the grey, unambitious clutches of the out and out commuter brigade. Variations, dependant on riding style, of two stroke consumption are legendary. I don't possess the worthy patience of others to sit for hour upon dizzying hour at a steady 30 mph to attain a figure which I feel will be of virtual irrelevance to readers of MCI. So, no "best" mpg figure was tried for, and the mere fact that less exuberant rid¬ing around town threw up approximately 48 miles to the molten gold will have to suffice. Estimates, gained from other owners and other tests, might say 50mpg, but life would certainly be duller at this speed. No - consumption, though it may be the biggest (if not only) black mark against the Yam, is still a small, barely entertainable price to pay for such performance. The darkling return journey, once the iniquities of the beyond hope visor had been hurled far behind, was carried out at a pace a mere fraction slower than that of the daylight run. The lights are good without being outstanding -up to 90 per cent of the machine's performance. Cat's eyes, as opposed to the white line, quickly restore the remaining ten per cent, so no great valid complaint can really be laid at the illumination. The simple point of the previous two paragraphs is to emphasise the fact that for 300 miles that day, the CSS was forced to its maximum. 300 miles full throttle effort is a lot of work for a 200 motor, a motor that was being treated in a way that an owner with considerations of longevity and repairs to take into account would be insane to treat his engine. Not once, and to be honest, much to my surprise, did the thing miss, splutter or in any way fail me. Another age would have spoken of "a sterling effort". I will just say good - damn good, particularly bearing in mind the beating the thing had taken, without any attention, for the previous fourteen days. And I emphasise again that so little of those fourteen days were spent at anything but the fullest of full throttles. The gearbox was obviously used far more than would be the case on a larger capacity machine. But this emerged as another enchanting feature of the thing. Light, positive, forgotten about. Frying your changes to their crispest in fact demanded that on upward selections the clutch was ignored. A solid, uninterrupted power flow, alteration of ratios denoted by a slight lowering of the engine's buzzing monotone. And by that only. After continual abuse such as this, neither gearbox nor clutch spoke any word of complaint. Mutch clutch slipping, if such pointlessness took your fancy, inevitably resulted in a half inch or so of extra play at the lever's end, but so much less than on other machines. Power characteristics, for such a highly tuned unit, were remarkably civilised. There was torque to be had, should you look for it. Indeed the machine could be left in lowest gear, clutch out of sight and mind, and the starter stabbed to throw the thing into life. The Yam would typically lurge forward for half a yard perhaps, and then immediately catch, chuffing along at its tickover speed of a thousand steady rpm (a wonderfully reliable 1000 rpm). And still the clutch would be forgotten. Impractical, of course, but indicative of the measure of the man below. The dividing line between mere conveyance and exhilaration lay at 4.5. The world was a far, far more interesting place after that. Once the excitement had started the only noticeable power step, and this a small one, started at a quiver below 7000, itself 500rpm below the claimed maximum power situation. Using these engine speeds in all the gears it had to be a very determined and four times more expensive sports car that could stay on the absurd little creature's tail up to 60 miles an hour. More probably, on reflection. I do have my doubts about the dearly beloved A10. So much more nimble, stable and agile. Several years experience would have to have been gained before that Yam's true qualities could be appreciated, and with those capabilities for medium distance, more than respectably paced touring, one wonders still further. And, of course, with the thing's monumental power to weight ratio, adolescent horsing around, such as absolutely effortless power wheelies in first and - though with a little more attention - second gear, became a part of everyday riding. Comments from other riders, one of them in a professional road testing position, ranged from "what a wonderful toy" to "utterly delightful".